The appeal of the Deevana Patong Resort is its secluded tropical garden with spa offering you tranquility and rejuvenation in the middle of the otherwise overly busy Patong Beach in Phuket, Thailand. 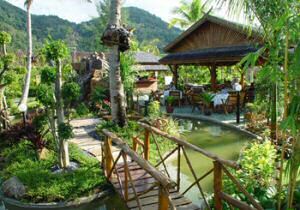 Apart from walking around in the luscious, tropical gardens, I enjoyed the Deevana Patong Resort for its spa. You could guess it: the spa is also located in the gardens with adjacent rejuvenating pools. Ideal for a romantic spa experience with your partner as the Deevana Spa is deigned to offer you seclusion and privacy whilst relaxing outdoors in nature. An unforgettable natural rejuvenating experience with typical ancient Thai beauty therapies as well as traditional Swedish therapeutic massages, aromatherapy, foot reflexology and even a slimming massage (not that I am in need of one, wink wink...). The Deevana Patong Resort reviews range from between very good and excellent, especially in the low season when you manage to upgrade yourself to a superior room with a Jacuzzi :-) Make sure to book in the spa wing and avoid the old and run down garden wing. However do enjoy the peace and tranquility of the resorts garden if you want to get away from the hustle and bustle of Patong beach. As anywhere in Thailand, staff is friendly and location is king in Phuket: only a small walk away is the overly well priced May's Restaurant serving delicious local food at equally local prices. The resort's restaurant however serves good Thai food as well.